Models are critical tools for understanding the behavior of natural and human systems that sometimes interact in surprising ways. Models also can be used to project future conditions, thereby helping to support informed decision making. The earliest climate models incorporated the atmosphere and the land surface. Over time, additional components that are now known as critical parts of the climate system—such as oceans and sea ice—began to be integrated. 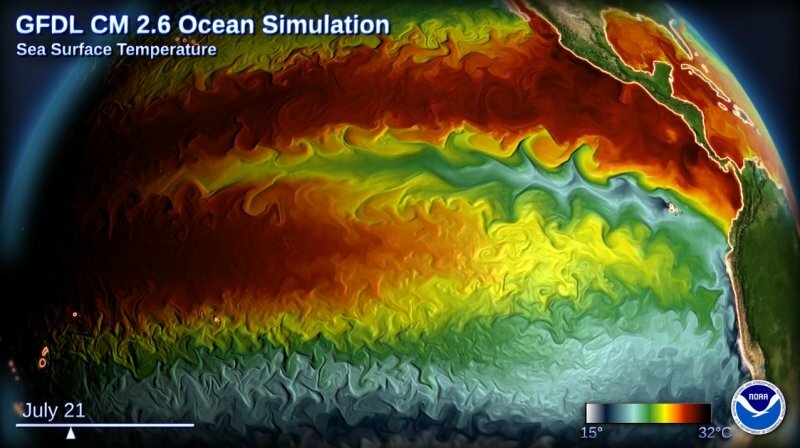 Sea surface temperature modeled by NOAA's Geophysical Fluid Dynamics Laboratory. Click for more details. Modern climate models have been expanded to include detailed representations of ice sheets, aerosols, biogeochemical cycles, and more, leading to better approximations of the real world. “Integrated assessment” models connect socioeconomic factors and natural processes in a single interdependent framework, allowing researchers and decision makers to explore a range of global change scenarios. Modeling is an inherently integrative activity, synthesizing the understanding of the complex Earth system gained from scientific principles, experimentation, and measurement. Earth system modeling brings together researchers from many different disciplines, and using models to support decision making brings scientists and stakeholders into close collaboration. To learn more about modeling of climate and global change, explore the resources in the sidebar.